Of the 2,147 miles that comprise the AT, the Great Smoky Mountains National Park accounts for 71 miles, including the highest peak along the trail (Clingmans Dome 6,643’). Of the National Park’s 848 miles of trails, the AT is by far the most popular. 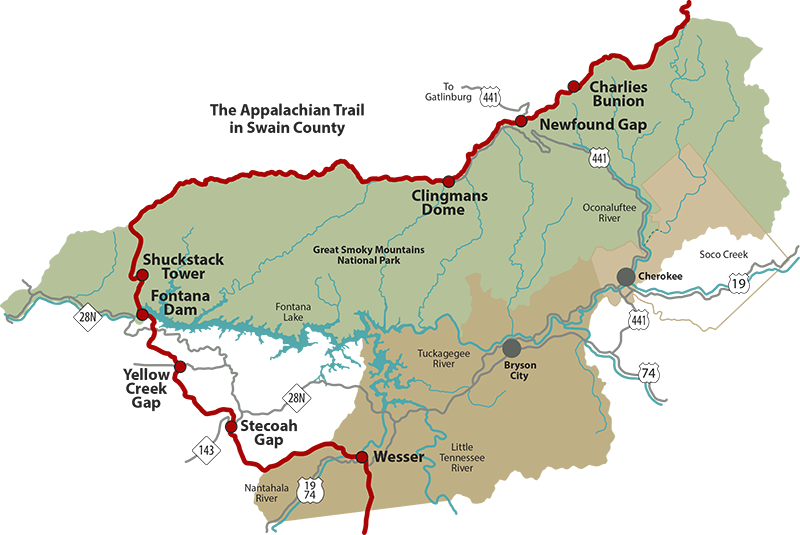 Clingmans Dome is the highest point on the AT, and Fontana Dam is the only dam crossing on the AT. The Trail through the Smokies also has the most rainfall and snowfall on the AT. in the South, and many hikers are caught off-guard by the snow and cold temperatures at high elevations. The temperatures at 5000 feet can be 10 to 20 degrees cooler than the valleys around Bryson City. You Read The Book, You Saw The Movie. In the film A Walk in the Woods, Robert Redford & Nick Nolte star as old friends who — ready or not — decide to hike the AT. Based on Bill Bryson’s bestseller, the movie co-stars Emma Thompson, Mary Steenburgen, Nick Offerman & Kristen Schaal. The movie has put a spotlight on the Smokies’ most popular trail — ‘our’ spectacular 71-mile section of the 2,190-mile AT. While most of the film was shot in Georgia, one scene has the intrepid duo walking across Fontana Dam on their way to the Great Smoky Mountains National Park. There are several segments of the AT in the Bryson City, Swain County area offering the opportunity for walks in the woods. Some of the day hikes are ‘out-and-back’. Others are one-way hikes requiring two vehicles or a shuttle. One is a three to four day, 40-mile backpacking trek. The most popular and accessible AT hike is the 4 mile segment from Newfound Gap to Charlies Bunion, a rocky cliff with one of the best views in the Smokies. 8 miles miles round trip, out and back Difficulty: moderate Elevation range: Newfound Gap 5049’ Highest point 6222’ Charlies Bunion 5565’ Directions to Newfound Gap — From the Oconaluftee Visitor Center in Cherokee, take US 441 (Newfound Gap Road) 16 miles north to the Newfound Gap overlook and parking. Take the trail east. See video below. Directions to Fontana Dam — take US-74 and NC-28 west of Bryson City for 32.5 miles. There’s a parking lot and welcome center at the dam. Cross Fontana Dam (the only dam crossing on the AT) and continue 0.6 mile to the trailhead. Hike the steep trail north towards Birch Spring Gap and Doe Knob. The trail climbs more than 2100 feet, with most of that elevation gain coming in the first 2.4 miles. Directions to Yellow Creek Gap: The Yellow Creek Gap trailhead is about 26.4 miles from Bryson City. Travel west on US73 to NC28 North. Continue on NC28 passing thru the tiny Stecoah community to Upper Tuskeegee Road. Turn left and watch for the AT trail crossing sign. This is an easy ‘drop off’ point, with a small parking area. Directions to Stecoah Gap — From Bryson City, travel west on US73 to NC28 North. Continue on 28 passing thru the tiny Stecoah community to the intersection with NC 143 (almost 21 miles from Bryson City). Turn left and continue to the top of Stecoah Gap. There’s parking for about seven cars. Directions: The AT crosses US19 at the Nantahala Outdoor Center in Wesser, 14 miles west of Bryson City. Parking is available. Fontana Dam is 32.5 miles west of Bryson City, via US74 and NC28. There’s a parking lot and welcome center at the dam. Cross Fontana Dam and continue 0.6 mile to the trailhead. Hike the steep trail north towards Birch Spring Gap and Doe Knob. The trail climbs more than 2100 feet, with most of that elevation gain coming in the first 2.4 miles. Important: All hikers camping in the backcountry are required to purchase a permit in advance. You will also need reservations at the shelters unless you are thru-hiking (defined by the park as starting your hike more than 50 miles outside the park and ending your hike 50 miles beyond). More information about the special regulations in the Great Smoky Mountains National Park can be found on the National Park Service’s permits page. 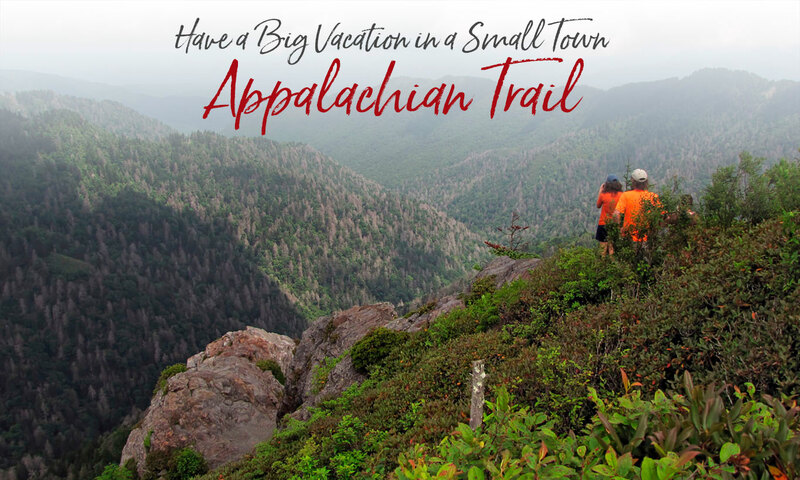 • The Appalachian Trail is managed by the National Park Service.